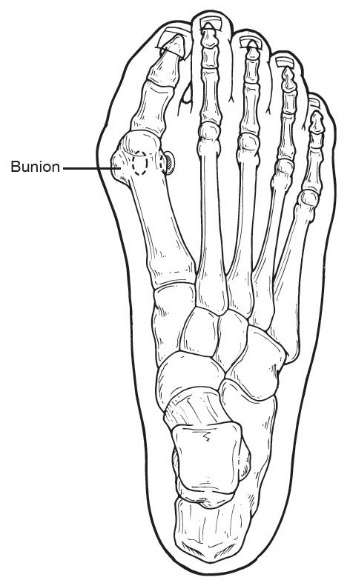 Bunions are readily apparent – the prominence is visible at the base of the big toe or side of the foot. However, to fully evaluate the condition, Dr. Hoffmann or Dr. Lagdaan may take x-rays to determine the degree of the deformity and assess the changes that have occurred. If non-surgical treatments fail to relieve bunion pain and when the pain of a bunion interferes with daily activities, it’s time to discuss surgical options with your doctor. Together you can decide if surgery is best for you. A variety of surgical procedures are available to treat bunions. The procedures are designed to remove the “bump” of bone, correct the changes in the bony structure of the foot, and correct soft tissue changes that may also have occurred. The goal of surgery is the reduction of pain. In selecting the procedure or combination of procedures for your particular case, Dr. Hoffmann and Dr. Lagdaan will take into consideration the extent of your deformity based on the x-ray findings, your age, your activity level, and other factors. The length of the recovery period will vary, depending on the procedure or procedures performed.